Can you handle the Rodeo Bull? 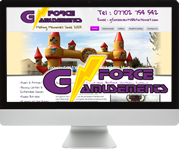 Local Business G Force Amusements have been providing bouncy castles, amusement rides and attractions to shows and fates throughout Northern Ireland for nearly ten years. As well as providing full event crew hire they have a large amount of children’s rides and attractions, fairground games and now even a Rodeo Bull for hire. As well as events for children G Force also specialise in corporate events with A Night at the races being a popular choice, they can even arrange all of the catering requirements for your event. We were delighted to produce a fun and dynamic website for the company which not only allows them to update the latest news and add galleries of photographs but also integrates with their social media platforms. The site is also responsive, meaning the same content will be laid out differently on different devices.